1. The bag itself. This is one of the first items I made in my original version of my Park Hill design (you can see how it's changed over time here). It's a big, sturdy, canvas bag with a piece of my fabric appliquéd on, edged with Liberty print bias binding. I've been using it for years now and can fit masses of stuff in it. All of the contents shown here sit in orange plastic trays inside the bag so I can lift them out easily (and find things). 2. Duplicate book. I use this in the event that someone requests a receipt. It's also a good place to write down orders (as people leave with a copy) for commission items or larger quantities of fabric. 4. Spare stickers and coloured paper. I use the stickers to add prices to my tags and always take spares in case I forget to do any, or a tag gets mislaid on route. The coloured pieces of paper are useful for general notes. 5. Clothes pegs. For holding stuff together, pinning stuff up, more often than not lending to other stallholders. 6. Vaseline. For chapped lips when it's cold (and for sore hands too). 7. Selection of string, twine etc. The normal string holds bags together, ties things onto a market stall, I use the nice one for my price tags. 9. Scissors (I've not shown my fabric scissors here, which I always take if I have larger amounts of fabric with me and may need to cut it). 10. Float (lives in the other bag, but had to include as forgetting it basically spells the end of the world - slight exaggeration). 11. Snacks (yes, this is a Lotus biscuit - yum). 12. Small coin purse - another one that lives in the other bag. For keys, non float money etc. 13. Notebook - this is where I write down all of my takings and anything else that's important. My notebook was a gift but it's from Smythson, and it's leather, and I adore it. 15. Cables. For charging the phone. 16. Safety pins. These little black ones (which it appears I'm nearly out of - eeek) are used to pin up backdrops and my signage as well as to attach tags to products. 17. Sellotape. I used to take a massive heavy dispenser of the stuff but recently (for the sake of my back and my sanity) I'm trying to reduce the weight of the things I'm lugging around, so this is a very lightweight plastic one. Lighter but I do need two hands to use it. 18. Washi tape. I very occasionally use this, but who wants to be out without washi tape?! 19. Pens - more than I can possibly use/loose. Prevents a repeat of the day I forgot a pen. 20. Box of business cards. I use Moo mini cards as they're cute, don't take up too much space, and double as tags when I punch a hole in them. They're very popular though so I get through A LOT of them. 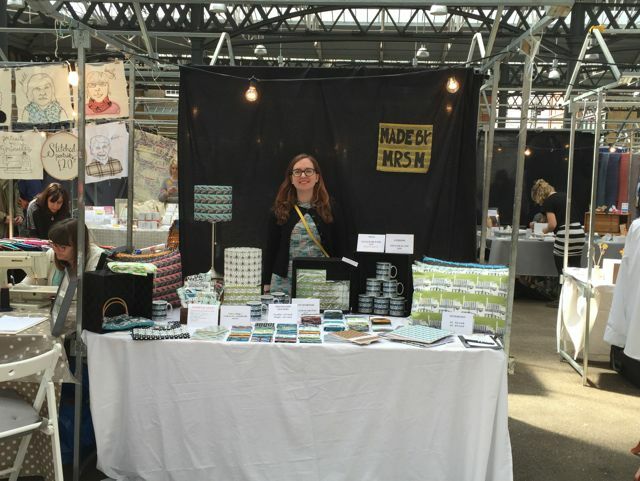 Find some more of my tips for markets and craft fairs here. Do you do markets and fairs? What do you keep in your bag? Stay in touch! Join the mailing list to receive my monthly newsletter.